To evaluate a way(s) to improve the occupancy rate at the Beaver Island Public Marina. Specifically to evaluate the integration of a “formal” reservation system for dockage to supplement the current “first come first serve” system currently in use. The occupancy rate is currently less than 50% during the “high season”. High season is defined as Memorial Day to Labor Day week end (see attached table). As expected, this rate is lower than typical mainland “busy” marinas such as (Charlevoix, Traverse City, Harbor Springs…) which claim 80%+ during the same period and 95%+ in July/August occupancy rates. Our rate is in line with a “non-destination marina” like Presque Isle on Lake Huron. In any event, there seems to be opportunity for improvement. As an indication a 70% occupancy rate would yield $16,000 additional revenues to the township. A difficult “debugging period” in the initial years which left harbormasters and customers frustrated. However I have been told by all harbormasters contacted (Traverse City/St Ignace/Presque Isle/Charlevoix) that it is working much better now, although still cumbersome. Some townships may be reluctant to give up “control” to the State. The marinas contacted which do not use the SCRS (Northport, Harbor Springs) state they are 90%+ full during the high season and that in several cases, such as Harbor Springs, boaters also have easy alternatives if that marina is full (Petoskey, Charlevoix….). I have also been told that several marinas use in fact some kind of reservation system (computerized or white board). For instance, Northport accepts reservations for boats over 50ft and parties of more than 5 boats; It is done on an honor basis and they claim people call on time if they cancel. The Traverse City marina Harbormaster says his occupancy rate increased with the reservation system (they use the SCRS). He thinks that, because of his marina being located at the bottom of the bay, boaters do not want to make that trip w/o being sure they have a guaranteed spot. This comment would clearly also apply to Beaver Island. The Charlevoix harbormaster has used a “simple” computer reservation system for years and is just converting to the SCRS system. While he considers the SCRS more cumbersome (but also more powerful), he claims that having a reservation system has increased his occupancy for similar reasons as Traverse City, and that the reservation has allowed his marina to attract more boaters from far away places such as Chicago. On the end customer side, my sampling was limited to dock discussions w/ boaters with long time knowledge of the Island. Not surprisingly, they all stated that Beaver Island should not get into the reservation system. If we want to get better sampling, I would recommend a simple dock survey which could be coordinated by one of the local high school students. This may also help understand why boats spent 10% less time at the dock overall and why sailboats days dropped more than 20% between 2008 and 2010. Note: I can also contact the blogger “son of a son of a sailor” if someone has his/her phone#. I am told by the State representative that there is no contractual language to maintain a minimum percentage of transient slips, have a reservation system or otherwise. The state does require that transient slips be available (w/ or w/o reservations) but does not specify an exact amount. However State documents show 75/25 transient/ seasonal. This is not an issue today for Beaver Island since there are only 2 seasonal docks at this time out of the total of 23. The Michigan Department of Natural Resources owns and sponsors 81 Harbors and lists several Harbors of Refuge on the Great Lakes. Some of the marinas and harbors are operated and maintained by local units of government through conditions of grant agreements. Harbors of Refuge provide a spot to moor until weather conditions improve, but there is no guarantee of a slip or dock space at these locations. Clearly, public marinas are not held to maintain open slips during inclement weather or otherwise. From a practical sailing standpoint, I concur since the natural harbor provides an excellent and safe mooring refuge already. In any event, the Marina can always keep a free spot if it so chooses (the pump out station?). The SCRS contract language provides for a multi tiered protection to the Marina in case of cancellation, up to first night rental+$10 cancellation fee if the cancellation is received after 0500pm. First time visitors who do not know the Island will feel more comfortable knowing there is “guaranteed space”, especially given the remoteness of the Island. Multiple boat rendezvous need a guarantee of space. Retirees which comprise more and more of the boating community need the “certainty” of knowing they have a dock available and not having to launch the zodiac from anchorage. The SCRS system will likely continue to deploy across the lakes as its improved “user friendliness” gets better recognized. We can also anticipate that as more customers become familiar with it, they will expect marinas to be part of it, or at least have a formalized reservation system. The courtesy dockage of zodiacs is an excellent initiative as it allows anchored boaters to visit current island businesses easily and should be continued even with a reservation system in place. All initial setup/invest/training costs are initially borne by the state. The state pays itself back through the $2.45/slip-night. This along with the $8 reservation fee could reduce the numbers of boaters willing to make the reservation. This is a small risk but we could mitigate this with a limited duration (try one year) contract with the State. They seem amicable to this from my preliminary discussions. Jason Sleming, state rep, has offered to present the contract and its details during an upcoming township meeting if the township board so requests. A more cost effective (?) “Low-end“ software. To be evaluated for invest/operating cost AND service. A manual “white board” system run by the Harbormaster. Please note that a reservation system will require more work for the Harbormaster, at least during the initial phase. Make sure WIFI is available at the boat docks and that it works. Make sure the Public Marina phone# is up to date in the next paper and electronic Harbor Guide versions. The Private Marina # is listed today! Advertise competitive costs seasonal docks (check minimum rates w/ the State). With all due respect and in regards to those requesting info as to why the BI Municipal Marina does not take reservations, I would like to present some facts and figures for consideration. The Municipal Marina is a Twp. Designated “Transient” facility in a “Designated Harbor of Refuge”. This gives the advantage to the transient boater with regard to safety. The Municipal Marina is not a state dock. We are a “Grant in Aid” facility. The Marina does not receive any taxpayer support. The revenue to operate the Marine comes only from fees collected from visiting boaters. The state Waterways Commission provides “oversight and guidelines” and does not determine how the Twp. Operates the Marina. This is solely the responsibility of St. James Twp., the facility operator! Revenue generated by “user fees” is returned to the Marina as capital to fund maintenance, utilities, insurance and salaries. In 2010 we had a total of 571 reg. vessels from which we received an average of $30 daily fee. We also had a total of 70 vessels visit which were given “Courtesy Ties”. These vessels are not charged a fee per visit. Roughly 45% of these Courtesy Ties were here to enjoy the Beaver Island Lodge. 30% visited Stoney Acres and the Shamrock with the remaining 25% going about the island. Also I allowed 42 dinghies a Courtesy Tie of up to 2 hours to shop, etc. This gives us a total vessel count of 683. In 2010 I logged a total of 668 requests for slips available for the 9 deep well slips that make up 2/3rds of the demand at the marina. I docked a total of 409 vessels that require deep depth, or length, or both; 232 sail, 177 power. For the remaining 16 slips that are 35 feet and under, I docked a total of 274; 193 power, 81 sail. My figures show July and August to be the busiest with regard to demand versus capacity and 2/3rds of this demand is for my 9 deep well slips. Reservations would only increase demand, not capacity. We do not have the amount of slips that would be needed to set aside, to set up a reservation system. We would require at least 1/3rd more to effect this. These 9 demanded slips are at 100% occupancy during July and August! Weather plays a deciding factor also due to our remote location, with an average distance of 45 miles versus 15 on the mainland. Many who call are turned back or delayed due to this disadvantage. The last 6 weeks of 2010 were all but lost due to extreme weather as was the first 6 weeks of 2011 in which I logged 115 requests for availability and which only 43 came out! July with its perfect weather brought us a total of 288 reg. vessels, 67 Courtesy Ties and 44 dingy visits for a total of 399 vessels (13 visits per day), which is over full capacity for July, 2011. This figure does not take into account our rafted “MAC Racer” visitors, a total of 41, of which 23 registered and paid a fee! Holding a slip would prevent this from occurring until the reserve slip hold shows up – undue burden! What would be the costs of operating a reservation system in terms of equipment and man-hours? For equipment only, approximately $3,000-$4,000 to wire, $2,000 for a computer, $200/month service fee. Who would enforce an open slip after hours? What cost for signage, etc. The docks are posted clearly now-“No Mooring, Restricted Mooring, Emergency Service dock, etc.” and are all ignored on an all too frequent basis. Currently we have 2 seasonal slips that pay only $0.33 on the dollar versus our daily rate. We would most likely revisit those to make up for lost revenue. Also, as I have an open slip now, I allow visiting vessels Courtesy Ties! If these slips are now held in reserve I would have to rethink allowing Courtesy Ties, or charge a fee to make up for lost revenue. Our priorities are the safety of Transient boaters (#1). #2 is the revenue generated by boater user fees which is our capital to fund our budget. 3rd is the incidental revenue that enriches local businesses. It is possible that some of this energy be directed towards our Private Sector marina as to how they may be assisted in improving their facility. B.I. Marina has the capacity and also currently takes reservations. Would the Municipal Marina’s taking reservations cause a conflict with them? Also, could the business community, possibly through the Chamber of Commerce pony-up and fund a desperately need dinghy dock to assist our anchored visitors? I would strongly suggest the new Veterans Memorial site, as it is centered between both ends of town and it is shallow – perfect for dinghies. It is being said that all Marinas (State/Municipal) take reservations. This is false. In the Harbor Guide for Lake Michigan, there are 35 facilities, only 11 of these take reservations. Also, that sailing vessels are at a disadvantage over power vessels when coming to B.I. Municipal. 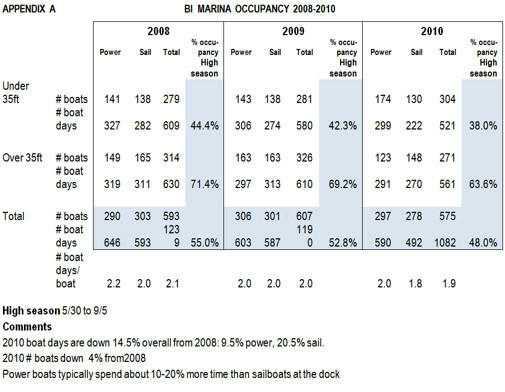 My documentation shows 53% of the Marina’s capacity in 2010 was sailing vessels, a clear majority. If we were to go to a reservation system, the Harbor Master would be continually obligated to hold those slips. Where does this leave the Transient or anchored vessel in case of weather or no-shows. What about the damaged or distressed vessel operator. Bureaucracy would supersede common sense!